Happy Labor Day! I want to extend a special greetings to all the folks who have to work on the one day we honor the working Americans. Today, I have a "special pack" of sorts. You see, I sent a "Scoring Adjustment Incentive (read, bribe)" package to Mark over at Gint-A-Cuffs. 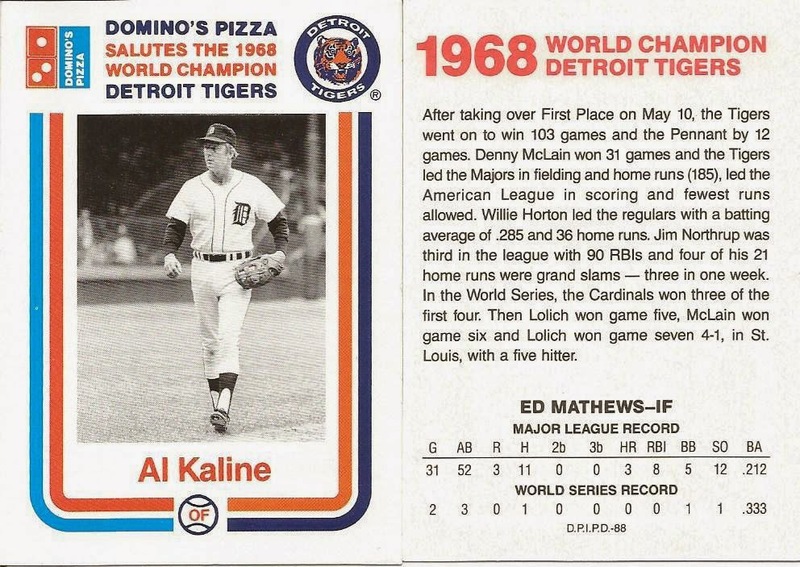 As part of that package, I bought a set of 1988 Dominos Pizza Detroit Tigers cards celebrating the 1968 Tigers. He really only needed one from the set, so I am going to list the rest of the cards here for the giveaway! Congrats to StealingHomes and Dayfs for grabbing cards out of this one. We'll have a bunch a free agents, for sure! "Happy LaboUr Day! I want to extend a special greetings to all the folks who have to work on the one day we honoUr the working CANADIANS. three minor fixes. better now. I thought Detroit was Little Caesar's territory. I guess Domino's was trying to muscle in! #PackADailyCircus - Draft time, finally! #PackADailyCircus - Whoops, it's Wednesday! ?